Today, I manage to get my lazy bum out of the apartment for a day trip to Wales on Anderson Tours which only cost GBP 37.00. It was one of those trips that I did not manage to get around doing when I was in London last time. We departed from EarlÃ¢â‚¬â„¢s Court station at 9.00 a.m. and made our way on the M4 directly to Cardiff. The coach was full and the journey took us about 3 hours inclusive of a 45 minutes break. City Hall, CardiffWe arrive at Cardiff a little over noon when we picked up our Welsh guide (luckily the guide speaks English or else I would have never understand a word!) and headed straight for the city center where we commenced our sightseeing tour on board. I was kind of struggling during the one hour sightseeing tour as the weather outside was about 23 Degrees and the bus was cold. I couldnÃ¢â‚¬â„¢t wait to get out as I can hardly snap any pictures from inside the coach. Cardiff CastleOnce we pulled to the side, we were only left with about an hour to do our own leisure sightseeing. If you canÃ¢â‚¬â„¢t see any pictures attached to this post is because I am still waiting to upload it. 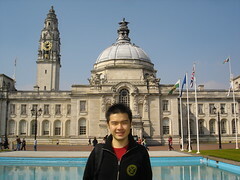 Places that I managed to take photos of were the entrance of The National Museum & Gallery, Cardiff Castle, City Hall, CathayÃ¢â‚¬â„¢s Park and the Millennium Stadium. Caerphilly CastleWe left at about 3 for Caerphilly Castle which is only just 15 mins away. 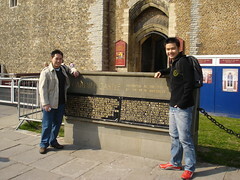 According to the guide, the castle is one of the largest in the UK along with Windsor and Dover Castle. This castle even has a portion of its tower leaning which out leans PisaÃ¢â‚¬â„¢s famous example. We started our journey back to London 45 minutes later with a scenic view of Wales. The journey home seemed longer and I arrived safely back at 8.30 p.m. I quickly ran into the first supermarket I can see to stock up for the long Easter weekend. ThatÃ¢â‚¬â„¢s all for now and I am still deciding where to spend my next weekend. Definately not in London.